ASHGABAT (Turkmenistan.ru) — The XVII international universal exhibition “White City – Ashgabat” is under way in the capital city of Turkmenistan. The exhibition aims to demonstrate the achievements, experience and prospects in the sphere of urban development, architecture and construction of Turkmenistan’s urban infrastructure. Over 80 Turkmen and foreign companies as well as enterprises of relevant ministries and departments of Turkmenistan participate in the exhibition. The foreign exhibitors include businessmen from Russia, Great Britain, France, Germany, Korea, Kazakhstan, Ukraine and other countries. Companies and enterprises participating in the exhibition offer their services in construction, power generation, processing and light industries, designing and all other spheres relating to the daily operations of a modern city. 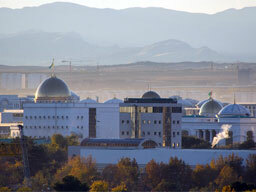 On March 23th 2013 Ashgabat was recorded on Guinness as the city with the most buildings covered with white marble. This is what is typical for the new buildings in Ashgabat. If during the Soviet times the city looked more like a small Russian country town, today it impresses visitors with new tall buildings, huge boulevards, white new cars.